3/35: Amazing 3-story beach home, on small lake just across the street from the beach. 4/35: Large 3-story multi-level home in a beautiful setting. 5/35: Beautiful living room with amazing views. 6/35: Beautiful living room with amazing views. 9/35: Open dining area with 12-place table and chairs, plus more seating in kitchen and also at open bar half-level down. 10/35: Open dining area with 12-place table and chairs, plus more seating in kitchen and also at open bar half-level down. 11/35: Wonderful open-bar area, amazing views, open to the kitchen just half a level up. 12/35: Wonderful open-bar area, amazing views, open to the kitchen just half a level up. 13/35: Huge master bedroom on 3rd floor with impeccable views and custom built furniture. 14/35: Another look at this incredible master bedroom with custom built furniture. 17/35: Extra bathroom and laundry combination on 2nd floor. 18/35: King bedroom 1 on first floor with great views. 19/35: King bedroom 2 on first floor with great views and private bath. 20/35: Private bath in first floor king bedroom 2. 21/35: First floor bedroom with 3 queen beds Full bath with huge walk-in shower is directly adjacent to this room. 22/35: First floor bath with giant walk-in shower. 23/35: King master bedroom on second floor with private bath. 24/35: Private bath for 2nd floor king master bedroom. 25/35: Bunk room on 3rd floor, semi-private. 26/35: Great little bedroom for kids on main floor with built-in full-over-full bunks, sliding pocket door for privacy, full bath just outside in hallway. 27/35: Hallway bunk room for kids, on main floor, end of hallway but not private, full bath right beside. 28/35: Beautiful full bathroom on first floor, in hallway where bunk rooms are located. 29/35: Second living area on first floor, the two king bedroom doorways are seen in this room. 31/35: Aerial photo showing the location of the home and its proximity to the beach. 32/35: The Crystal Beach neighborhood is as good as it gets in Destin. 33/35: View of the front of the house. Parking for 3-5 cars in the driveway. Property Size 3,453 sq. ft.
An ideal home for 4-5 families with children, or 14 adults max. This new listing is one of the nicest homes in Crystal Beach! This amazing home has everything you could want and more in a luxury beach home for a large group – an incredible pool on the edge of a beautiful private lake, a huge one-of-a-kind professional kitchen, and inviting living, dining and gathering spaces. This well-planned 3-story home is built on 5 levels with outside decks to maximize the lake views, and it’s only about 200 yards from Kokomo Cove’s own private beach access! Your group will appreciate having 6 BEDROOMS and 6 FULL BATHROOMS. There are 4 King Masters, a large bedroom with 3 Queen Beds and a Bunk Room with custom built-in full-over-full beds (2 full beds). There are also 2 sets of twin hallway bunks (4 twin beds) that children will love. The deck around the pool has recently been expanded to give you plenty of space to enjoy the Destin sunshine and the lovely lake view. This is the vacation home you’ll want to return to again & again! Every room has been thoughtfully designed to be comfortable and functional, as well as beautiful. Even the hallways and bathrooms are designed to give you plenty of space to relax and make yourself at home. We keep this home clean and well updated and pay attention to amenities that you expect, such as high-speed internet (free wifi), nice flat-screen TVs, high definition cable, big, fluffy bath towels and hair dryers in each bathroom, and more. We also provide items our smaller guests may need like a high chair and pack-n-play. This extra-large bedroom at the front of the house features 3 QUEEN BEDS with bright quilts and soft Egyptian cotton sheets. There’s plenty of room to move about with bedside tables and lamps between the beds. There’s a flat screen TV, a luggage rack and a large closet in this room as well. This room is a favorite for teens and adults alike. This bathroom is adjacent to the Triple Queen bedroom and has a large vanity with storage, commode, and a huge walk-in shower. Down a short hall is a small bunk room with built-in full-over-full bunks (yes, that’s 2 full-size beds). There’s a small dresser here and a pocket door that allows for privacy in this room. Across the hall from the Bunk Room, you’ll find two built-in twin bunks tucked into the hallway. They feature fun and comfortable cotton quilts. Children love these cozy beds! In the hallway with the bunks, is this awesome bathroom with a stunning tile mirror, large vanity with open storage, commode and beautiful custom tile tub/shower combination. This lovely room features a KING BED with a new cotton quilt and super soft sheets. There’s a small dresser and wall-mounted TV, as well as a closet. You’ll appreciate the attached private bathroom too. This beautiful bathroom features a large vanity with single sink, commode, and a custom tile tub/shower combination. Down a few steps, you’ll find an open living area with a comfortable sectional and chair, as well as a flat-screen TV. This room is nice and bright with transom windows and French doors leading out to the decks which lead to the pool. This comfortable bedroom off the living area features a KING bed with a bright cotton quilt and super soft Egyptian cotton sheets. There’s a small TV, wonderful light from two windows, and a great view of the private lake. When you come up the stairs, you’ll be stunned by this incredible kitchen! It’s really like no other, with custom wood finishes, commercial appliances, massive work areas and eat-in bar area that looks out over the living area. 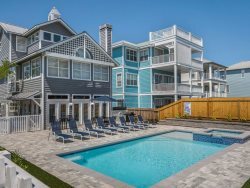 It’s probably the best kitchen in the entire Crystal Beach community, with a commercial Viking Stove/Oven, 2 kitchen sinks, 2 Frigidaire Professional Dishwashers, and a Brand New Professional Refrigerator/Freezer. It’s truly a cook’s dream kitchen – and your whole family will love it! There’s seating for 12 in the spacious dining room, plus seating for more in the kitchen and at the separate bar area below. A few steps down from the kitchen and dining area is a beautiful living area with two comfortable sofas and chairs, a fireplace and a large flat-screen TV. There are windows all-around and two French doors leading out to the grilling area and deck that overlooks the pool. Tucked around the corner from the living room, is another great gathering spot with a beautiful white granite bar and seating for 5. There’s a refrigerator, sink and plenty of storage behind the bar. Your friends can sit at the bar and enjoy the beautiful lake views. The thoughtful layout of this space makes this a perfect home for large groups – lots of room to relax and spend time together. This extra-large bathroom is perfect for the main living area of the house. It features a long tile counter with sink, a commode, and a beautiful glass shower. The front-loading washer and dryer are in this bathroom too, which makes it very convenient for everyone. There’s even an exit to the outdoor deck from this bathroom…just go down the steps to the pool. This bedroom features a beautiful custom made KING bed with a new cotton quilt and Egyptian cotton sheets. You’ll appreciate the dresser and double closet for storage, as well as 2 nightstands and lamps for reading. There’s also a large flat-screen TV in this room, as well as an attached bath and access to a small, private balcony. Attached to the King Master bedroom, this private bathroom features a beautiful vanity with sink, commode, and tub/shower combination. You’ll find a set of twin bunk beds (2 twin beds) on the third-floor landing – it’s a perfect place for children to be close to their parents in the master bedroom next door. This gorgeous bathroom will probably be your favorite! It has a huge custom vanity with two bowl sinks, and a unique, free-standing soaker tub. You have great views from the vanity, as well as from the incredible walk-in tile shower! There’s a private commode, hanging storage space and even an exit to a small balcony for more great views! This amazing room is filled with windows for great light and incredible views! It features a custom made KING bed with beautiful linens, a comfortable chair and 2 bedside tables with lamps. You’ll appreciate the dresser and large closet for storage, as well as the flat-screen TV. And you can step out onto your private balcony that overlooks the lake! The beautiful, private pool (10’ x 20’) is surrounded by a newly expanded wooden deck and offers plenty of seating, including loungers and Adirondack chairs. The pool is next to the private lake, so you can sit by the pool and enjoy the lake views! You can even check out the lake from the attached dock. Pool heat is available for an additional fee. BEACH – If being close to the beach is a priority, you’ll definitely appreciate the private beach access just at the end of the street, across Scenic 98. We provide a cart with beach chairs and an umbrella, so you can roll your gear to the beach with ease. This home is in a quiet neighborhood with easy access to shopping, restaurants, and activities in Destin. Destin Commons, a beautiful upscale shopping and entertainment center, is close by. It features over 75 shops and restaurants, including Bass Pro Shop, World of Beer, Panera Bread, Uncle Buck's Fish Bowl & Grill, AMC Theater with IMAX and much more. The Crab Trap is 1/2 mile east. You can bicycle, scooter, Jet ski and go para-sailing all within walking distance. The Silver Sands Outlet mall is not far for those who enjoy “retail therapy”! Jeff was so nice to our group. We felt that he really cared about us and our time in Destin. We had questions throughout the week, and he was always concerned and so willing to help. Vertical Vue was beautiful! When looking at the pictures I didn't believe it would be that nice in person, but I was wrong! It was amazing, and was perfect for our large group. The kitchen was fantastic, and was very nice for us to have with so many people wanting to cook at the same time. We loved the view of the lake behind the house by the pool. We were so sad to leave, and we can't wait to return next year!